I wouldn’t call the current group of DTs a weakness but there is plenty of room for improvement across the board. Hankins has blossomed in to a quality three down player. He is a force against the run with his ability to control multiple gaps and make plays when he is single teamed. If you made a list of the top 10 DTs across the league, Hankins has a right to be on it. Jenkins and Ellis provide the balance of run and pass defense from the inside. Jenkins is a versatile and savvy defender that can take advantage of matchups inside and outside, while Ellis was brought in to add a much needed run defender to keep linebackers clean. The wildcard here is Bromley, a potential pass rush presence that NYG desperately needs. Many, including myself, believe he was over-drafted in round 3 last year. He has every opportunity to be a difference maker along this defensive line. Kuhn and Hamilton can compete for jobs, but neither have proven to be difference makers and decisions won’t be made based on them. Strong Points: Physical marvel that has made an impact from day one of his career. Freakish combination of size, speed, and strength. Strong hands that grab on to the blocker and can toss them aside with ease. Plays with a low base and high hands. Holds the point of attack whether he is up against single or double teams. Powerful bull rusher up the middle with the ability to collapse the pocket. Can get to the quarterback a variety of ways from different spots along the defensive line. Versatile athlete. Can accelerate off his blocks. Can use his strength or quickness at any given point throughout the engagement. Explosive tackler that swallows ball carriers. Very aggressive, high effort player. Tough gamer, plays through injuries at a high level. Weak Points: Doesn’t read the action around him. Will be forced in to compromising positions against trap blocks. Slow reaction to complex blocking schemes. Relies too much on strength and power rather than technique. Footwork is inconsistent. Doesn’t play the game with his feet as much as he does his hands. Summary: Junior entry. Widely considered a top tier talent in this draft class as a whole. Williams is a true nightmare for offensive linemen. He is too big and fast for a lone blocker to take on. He can be moved around the defensive line in any scheme. His short area explosion and power presence can be a dominant force within the tackle box against the run. His speed out of his stance and variety of rush moves can collapse the edge of the pocket against the pass. There isn’t much that Williams cannot do and his impact on the NFL will be immediate. *My top overall player in this class. He is expected by almost everyone to be one of the first two or three picks in the draft. He could fit the NYG scheme like a glove because of his inside-out versatility. He could legitimately play the 4-3 LDE role or the UT role. His length and foot speed make him a tough matchup for any kind of blocker. Combine that with his top tier intangibles and mental awareness on the field, Williams is probably the safest pick of the draft and offers All-Pro upside. Strong Points: Powerful and high energy pocket collapser. Quick thinker that can read the action around him. Very smart and aware. Plays with a low and strong center of gravity. Can anchor his position against double teams. Generates a high amount of power from both his legs and hands. Stifles and controls the blocker with his initial punch. Pursues and hustles from sideline to sideline and all the way downfield. Gets near the action often. Can shed blocks several ways. And pull and jerk, undercut, and spin his way off the blocker. Light on his feet when he needs to be. Tenacious pass rusher with a violent and surprisingly athletic style. Can bull rush his way deep in to the pocket. Carries a lot of weight but moves surprisingly well. Weak Points: Had several maturity issues early in his career. Weight will need to be monitored, as he carries a lot of loose meat. Initial explosion and quickness off the snap isn’t there. Will over pursue and neglect assignments. Struggles to change direction in short space. His momentum carries him out of the play. Summary: 1st Team All American. Shelton has improved each and every season of his career both on and off the field. His maturity issues appear to be a thing of the past but those they still need to be investigated. Between the sidelines Shelton is a terror for linemen to block. He has tremendous functional power and strength. He is a high effort player that plays through the whistle with consistency. He outplays what his body type says he can do. He improves as the play goes on because of his rare ability to get off blocks and chase down the action. Shelton can fit in to any scheme and start from day one in the NFL. *Shelton turned in to the favorite player of many people over the past 8 months. His senior season helped his draft grade as much as anyone in the class with All-American caliber production. I’ve seen a lot of him and I can’t say there is a “special” here, but by no means do I overlook his potential to be a terror for a defense from the inside. He can be a valuable run defender for any kind of scheme, not just the 3-4. He will absorb blockers but there is also a level of effort and ability that gets him involved on a lot of tackles. Pairing him with Hankins would create a sense of inside dominance against the run for NYG. He doesn’t fit the mold of what NYG usually goes for at DT, but I think there is still a good possibility he is their pick at #9 overall. NYG needs more consistent and reliable presence inside and pairing Shelton with Hankins would do exactly that. With a defense that needs more attitude, Shelton could be an immediate game changer. Strong Points: Big everywhere with a lot of functional strength. Long and thick frame that moves with plenty of athleticism and balance. Can play with proper leverage, bending easy at the knees with hands high. Can move his body quickly in tight spaces. Absorbs the double teams and anchors his position. Always seems to be in control of the engagement. Neutralizes the blocker and frees himself with a powerful grip and strong base. Swallows up the ball carrier when tackling. Wraps up well. Can fill an open lane while engaged with a blocker. Can diagnose by feeling the pressure from blockers and flow towards the action. Weak Points: Strictly an in between the tackles player. Won’t make a lot of plays away from the line of scrimmage. Doesn’t explode in to the gaps. Will get too high once engaged, losing out on a lot of his strength. Limited pass rusher. Lacks the moves and hand work to free himself. Will almost always use a bull rush, needs more variety to his pass rush repertoire. Summary: Two year starter that doesn’t jump off the stat sheet but makes his presence known every play. Huge frame that carries a lot of weight with ease. Consistently gets that push at the point of attack and will demand attention. He can keep the linebackers behind him free of blockers while clogging the inside running lanes. Davis has some sneaky athleticism to his game as well. When the action is near him, he can move his way towards the action and make a play. There is short area quickness and burst that very few players his size possess. He can be an impact player right away in the NFL in any defensive front. *Davis is an intriguing case and prospect. There have been flashes from his time both at Iowa and the Senior Bowl where he looked like a top 10 player in the draft class. His size and presence was constant. He isn’t a guy that gets pushed back. He looked like a man among boys at times. His role in the Iowa defense was more about reading blockers and staying at home, absorbing space and bodies. Every now and then however, I would see him break out of his stance and carry multiple blockers in the backfield. After seeing him do the same at the Senior Bowl, I left with the impression there is some “special” in this kid. There are rumors of work ethic issues and he did seem to tire easily at Iowa, but I haven’t confirmed anything there. Davis is more than a run defender but very much like Shelton, his worst case scenario is a guy that is plus space eater with the upside of being another Hankins-type, true three down guy. Round 2 value would be very good here. Strong Points: Thick from head to toe. Long arms and a wide frame, hold his weight comfortably. Fires out of his stance with his hands up and ready to go. Easy bender, stays below the pads of the blocker, consistently winning the leverage battle. Strong, heavy hands that are very functional. Aggressive at the point of attack. Shows the strength to anchor his position at the very least. Handles the double teams to keep linebackers clean. Effective bull rusher. Creates a tremendous amount of force to press the pocket. Can get in to a quarterback’s step up space in a blink. Has the quickness to jump out of his stance and in to the backfield. Can carry blockers in to the pocket. Weak Points: Not as effective when he needs to use skill-based rush moves. He struggles to shed blocks if he doesn’t get the initial advantage off the snap. Lacks speed in pursuit, not a space player. Has lapses in concentration. Won’t read blocks and is often found out of position. Creates big cutback lanes and won’t always stay true to his assignment. Doesn’t always have the leg drive to produce maximum power. Summary: Junior entry. Gifted athlete that has all of the physical traits that teams want out of a defensive tackle. Size, speed, flexibility, coordination are all there. Goldman often under-produced considering his ability. He has shown glimpses of being a terror to block inside, however. He is very quick off the snap and can bull rush the strongest of pass blockers deep in to the pocket. High potential athlete but still needs a lot of work on some of the finer, mental aspects of the game. *It took me a few games to get a feel for Goldman and really appreciate the kind of player he is. I’ve known of him for a few years now, as I watched him play in high school here in NJ and I remember thinking NFL while watching him warm up. He is a little bit of a freak. He carries a lot of weight with ease, an athletic 330+ pounds. At FSU he never really broke out in to a playmaking, gap shooting defender but that doesn’t mean he didn’t perform. Goldman might be the best run stuffer in this class when it comes to eating blockers and chewing up space. He is the guy that rarely, if ever, gets pushed back regardless of having one or two blockers assigned to him. One thing that prevents him from a first round grade, however, is a lack of awareness and reading ability. He is late to recognize and won’t get near the action as much as someone like Shelton does. For the role he would play here in NY, Goldman would be a force. He is a better version, but similar player to Linval Joseph. And for those that like “inside info”, I have heard NYG has a high grade on him. Strong Points: Stout frame with equal thickness through his upper and lower body. Powerful and quick off the snap. Can explode out of his stance and reach the blocker before he is set up. Easy bender, consistently plays with a low pad level and body control. Incredibly strong hands. Can grip and rip the blocker away. Shows consistent ability to get off blocks and free himself up. Quick reaction. Can move fast within a phone booth and will make a lot of plays behind or at the line of scrimmage. Packs a big punch. Hits hard and can turn speed in to power right away. Accelerates off blocks and has range within the tackle box. Weak Points: Shows a tendency to get stood up if he doesn’t win off the snap. Can get locked on to and struggles to get off the blockers that have a lot of hand strength. Lacks athleticism the further in to space he gets. Struggles to reach the blockers with his hands. Won’t always get inside position and it will take him longer to free himself. Will compromise his assignment but trying to get around blocks rather than stay in his gap, creating lanes. Summary: Junior entry. 1st Team All American. Was nominated for some of the most prestigious defensive awards in college football. Is married with two children. Brown is a tough assignment for any blocker. He has the quickness off the snap to get in to the backfield within a blink of time, has the strength to toss blockers to the side, and has the instincts to naturally flow towards the action and always be around the ball. He knows how to finish. If he can stay on top of his technique, Brown has the potential to be one of the best in the league. *There are some people I respect that have a top 10 overall grade on Brown. I like him, but not that high. There is a nice blend of talent here when looking at his size, movement off the snap, and ability to disengage from blockers. He lacks the standout quality though and too often I see him getting pushed off the ball. He doesn’t exactly anchor against power blockers. He is a gap shooter without top tier explosion ability. I think Brown is going to get over-drafted but that doesn’t mean I think he is a bust waiting to happen. He’ll be a player, just not the immediate star that some are saying. He can improve his game a lot with a simple in consistency of technique and mechanics. The talent is there, just not sure the skills are. Strong Points: Massive presence. Tall, long, and functionally thick. Quick out of his stance and makes the offensive line react to him. Can get his hands on the blocker and control the engagement. Quickness to either side, moves well laterally. Hard hitter, can forcefully pound a ball carrier in to the ground. Has such a wide reach, can close a hole fast. Gets off blocks with sheer power or quickness. Consistently pulls and jerks offensive linemen out of the way. Elite strength from his base. Can anchor his position against double teams without giving up any ground. High effort player, consistent engine. Can press the pocket, bull rushes his way to the quarterback. Weak Points: Limited athlete in space. Does not pursue well to the outside. Ball carriers can outrun his angles. Will play high out of his stance, exposing his numbers to the blockers. Lacks an array of refined pass rush moves. Lacks versatility and may not be a three down player. Doesn’t have that explosive element to his game. Back injury ended his 2013 season after 4 games. Summary: Fourth year sophomore entry. Redshirt in 2011 and a medical redshirt in 2013. Limited experience player, but has the upside of a dominant inside force. Phillips demands the attention of multiple blockers every play. His combination of size, strength, and quickness off the ball consistently creates havoc. He is a space eater inside that is rarely pushed back by the double team. He can shorten a pocket when a blocker is left alone to pass block him. Phillips can be an immediate force inside at the next level as long as his back holds up. May never be a star, but he will be reliable. *It took me awhile to catch on to Phillips, as I didn’t realize he was draft-eligible until December. There are games where Phillips reminded me of what Albert Haynesworth looked like the year prior to his free agency with Tennessee. There isn’t a blocker in the country that can keep Phillips from pushing the pocket. His combination of size, strength, and speed is too much for a lone man to handle. The problem for Phillips is actually one of his strengths, his height. He isn’t very well conditioned, so when he gets tired he stands straight up and makes it much easier for blockers to prevent from impacting the play. I don’t think there are effort issues here, but I’m just not sure he can be a 3 down guy. As part of a rotation, he is a guy that can be moved around to force an offensive line to shift a certain way, making things more predictable for linebackers. There is a back issue that needs to be looked in to, as I know some scouts have given him a big downgrade because of it. Not a good thing for a guy that already struggles with leverage from time to time. Fully healthy, Phillips can be one of the top players in this class. Strong Points: Quickness of the snap with a powerful upper body makes him a touch matchup. Exceptional athleticism for a player his size. Can overwhelm blockers with movement on one play and strength on the next. Gets his hands on fast and can shed blockers . Comfortable in space and in traffic. Can break through the pocket several ways from different spots. Can turn the corner with full body control while moving at full speed. Can bull rush and push the pocket. Weak Points: Really only had one year of productivity at the D-I level. Lacks lower body size and strength. Lacks the ideal body type for play between the tackles. Doesn’t play with a low-enough pad level. Will bend at the waist and rely too much on movement and upper body strength. Won’t generate a pop to the blocker out of his stance. Summary: Fourth year senior. Spent two years in junior college prior to joining the Sun Devils. Hardison was not an impact player at all in 2013 but broke out in a big way in 2014 with 10 sacks and 15 tackles for loss. He was a tough matchup for tackles, as he was simply to strong, quick, and powerful to consistently block. He had surprising ability to move quickly in a short space for a player over 300 pounds. In the right scheme he can be a very good interior pass rush presence and/or outside run defender. Teams that like to move their defensive linemen around based on matchups will love Hardison. As he continues to strengthen his lower body and improve the consistency of his technique, Hardison could end up being a big time presence. *If NYG is looking to add an interior pass rush presence, Hardison needs to be given a hard look. He mostly played a DE role for ASU, but his body type and style of play can fit inside within a 4-3 front. He is quick off the ball and plays with heavy hands. Hardison doesn’t get the attention that I think he deserves. Very few defensive tackles in this class can do what he does. Is he an every down guy? Maybe not as a DT but I think you can get enough out of him as a run stuffing LDE and pass rushing DT. If he is there, starting in round 3 which I am sure he will be, he will have my attention. Strong Points: Explosive north/south mover that can fire out of his stance and shoot the gaps. Consistently beats blockers to a point. Plays with a low center of gravity, making him a tough target for blockers to lock on to. Quick and powerful hands. Refined rush moves. Has a tenacious, almost wild get off when shooting the gaps as a pass rusher. Has the explosion to close a five yard gap in a blink. Productive and effective within the tackle box. Can react well to the action and flow towards the ball. Weak Points: Lacks ideal size and length. May need more weight on his frame. Struggles to reach for the blocker and control the engagement with his hands. Struggles to anchor his position as a stay at home defender. Too easily moved by the blocker when he is locked on to. Won’t recover well after being initially beat after the snap. Doesn’t occupy space and multiple blockers at the same, time. Shows a lack of speed and effort once the action is outside the tackles. Summary: Fourth year senior with almost 30 career starts. Son of parents that both went to West Point and served in the military. Team leader. Bennett is a one-gap penetrator that may be restricted to certain schemes in the NFL. His initial quickness and ability to break the pocket will be sought after by most 4-3 defenses in the league, most notably the Tampa-2 based schemes. He is consistently faster than the blocker, gaining the initial advantage. He lacks the staying power against the run and will need to get stronger before he is an every down player, however. Good role player type that can excel against the pass, always a trait in high demand. *Another pass rush specialist here, however I am not as high on him as some are. Bennett has the quickness of the snap and he can be a solid gap shooter that makes guys adjust. I think he can fit in to pass rush-only type role but when it comes to every down duty, I think he will be a liability more than an asset. He gets pushed off the ball far too often and unless he gets the initial positional advantage post-snap, he can be rendered ineffective. He is the kind of guy that simply won’t keep the linebackers clean. If he could be had in round 4, I would think it’s good value but I think he ends up going in the first 3 rounds. Strong Points: Exceptional athlete for his size. Carries 300 pounds with ease and moves like a player that is much lighter. Can explode out of his stance and get in to the blocker’s body right away. Gets his strong hands on right away and works hard to control the engagement. Can stick his feet to the ground and maintain his position against power blockers. Can feel the flow of the action and get himself in position to make an impact. Smart, quick reactions. Relentless pursuit of the ball carrier. Face up tackler that can deliver a violent impact. Top tier speed in pursuit, will reach the sidelines from his interior spot. Often found downfield, never gives up on a play. Weak Points: Lacks the ideal bulk for interior defensive line positions. Light in the pants. Will need to enhance his upper and lower body strength. Gets by on hustle and grit, but doesn’t show a lot of pass rush moves. Needs to improve the skill-based aspects of the position. Will play too high and expose his chest to the blockers. Summary: Junior entry. Three year starter. Cooper played a couple of different defensive line positions for the Cougars. He played in a 3-4 DE role, but also shifted inside in four man fronts and excelled in both roles. He is a long athlete with a lot of open field athleticism. His playing speed is rare for the position. Cooper was an accomplished high school basketball player and it shows when he is in space. At the point of attack, Cooper is a violent and quick defender that has plenty of functional strength to hold his ground and stifle ball carriers. There is a lot teams can do with him, and once he gains some strength and girth, he could be an every down force in any scheme. *At first glance, after seeing two of his games, I had Cooper as one of the top pass rushing DTs in this class. He is another guy that can play inside/out, showing too much quickness for guards and too much strength for the tackles. He is a high-motor player that has more lower body strength than you would think by looking at him. He showed the ability to anchor his position against power blockers and the way he accelerates off blocks is noteworthy. He is a superb athlete with pads on. My biggest gripe with him is a lack of size. He isn’t thick enough and lacks the necessary to length. As a rotational, day three pick Cooper can be a steal. Strong Points: Stout and powerful at the point of attack. Tremendous use of leverage and lower body strength. Quick and low. Easy knee bender that can move quickly in a short space. Can press defenders off his body and get the separation he needs to make any sort of lateral movement. Turns a corner fast, easy change of direction. Constantly near the action and can tackle with force. Weak Points: Limited athlete the further in to space he gets. Does not have the height or length that a typical defensive tackle prospect has. Limited skill set as a pass rusher. Summary: Underrated, overlooked defender that wore a few hats for the Stanford defense. Does the dirty work inside, demanding attention and keeping linebackers clean. Parry can do more than eat space, he is a force between the tackles. He doesn’t stay blocked for long because of his consistent, relentless approach. His low center of gravity packed with power and quickness make him a tough assignment every down. *There is a part of me that thinks Parry could go undrafted because he lacks tools. I’m keeping my 4th round grade on him though. He is a football player, pain and simple. I watched Stanford early in the year to get a look at some of their other notables, but Parry just kept on jumping off the screen. Talk about a disruptive presence inside, Parry plays the game with a wrestler’s type leverage and won’t be pushed back. He showed some ability to do more than occupy blockers with quickness and a nose for the action. He found the ball carrier often and finished off plays more than your common 3-4 NT. Does he fit in the 4-3? I think he does. There is demand for a presence like this when looking at the NYG interior defenders. He’ll be a favorite of the team’s linebackers and watch him out-produce several players drafted ahead of him. *I like the frame and movement off the snap. He can be an early contributor with his power presence on the move, but may lack the ability to anchor his position against the run. *One of my top small school prospects. Started off at Georgia but struggled to see the field. Went to a lower level of college football and showed flashes of dominance, as he should have. A player with this size and pass rush ability shouldn’t be overlooked. Day 3 value would be nice here, I like the upside. *Undersized, yes. But you’ll struggle to find a DT that plays harder than this guy. His lack of size shows up on tape here and there, but you won’t go more than a few plays without seeing him make an impact. Not a fit for every scheme and his role is pretty specific, but he can help a team looking for interior rush. *Another small school guy with an intriguing tool set and developed skills. Walton is more than a run plug, he showed some good movement between the tackles and if the light turns on, you are looking at a starting caliber player that can fit multiple schemes. He’s a guy I think sneaks in to the top 3 rounds. *Yet another undersized pass rusher from the inside. Philon was really productive and looked unblockable at times. For awhile I questioned if he was a better prospect than the well known Trey Flowers, a DE we will talk about later in the week. The lack of length will hurt him in the NFL but he can carve himself a niche somewhere. *Limited athlete but a dependable run defender. He can anchor his spot with consistent leg drive and leverage. Won’t make plays but he is a guy that fills out a roster and will have a job as a backup run defender. *If it weren’t for the confusing off-field issues, Orr could have been a top 10 guy on this list. He left the team after being taken out of the starting lineup, which is odd. His story has been tough to look in to but when I watch him, I see upside. He can really move and he carries 320+ pounds with ease. He just screams NFL defensive tackle and I think he fits the 4-3 really well. *Played a 3-4 NT role but he can fit multiple schemes. Made plays in 2014 that most people probably didn’t see because if they did, he would have been at the combine. He is a lot better than several guys that were there. Run defender first, but showed the short area quickness to take advantage of opportunities. *Really strong upper body, a guy that just bench presses blockers off him and will locate the ball. Might be undersized for the role he plays but he is tougher than nails. I saw Oklahoma State 4 times and each time I had positive notes on him. *Undersized and beat up, but watch his 2013 tape and you cant help but wonder if this guy should be a 1st rounder. Covington has the blend of quickness and power that gives blockers a headache. He had a pretty nasty knee injury last fall though and some teams have crossed him off their board after failed physicals. *Overlooked defender on an underrated SEC defense that has a few defenders getting a lot of attention for next year’s draft. Blackson kept linebackers clean with his disruptive nature off the snap and was rarely pushed back. Dirty work guy that has the frame to add more good weight. He has more mechanics and consistent technique than some of the top guys on this list. While some may view DT as a lesser need of the roster, it’s a position that really hurt this defense in 2014. Hankins is evolving in to a force but he can’t do it by himself in a 4 man front, there needs to be another presence along side of him that makes the opposing offense gameplan around. This prospect group is an interesting one in that there are a lot of guys that can help the run defense or pass rush, but not both. What does NYG need more? A credible argument can be made for both but finding a guy that can do both is going to be very tough. I don’t think any of these prospects (outside of Williams at the top) will be worth their #9 overall selection. But once they are on the clock in round 2 and from there on out, NYG needs to be looking at some of these prospects with the thought that one of them can take this unit’s run defense to another level. 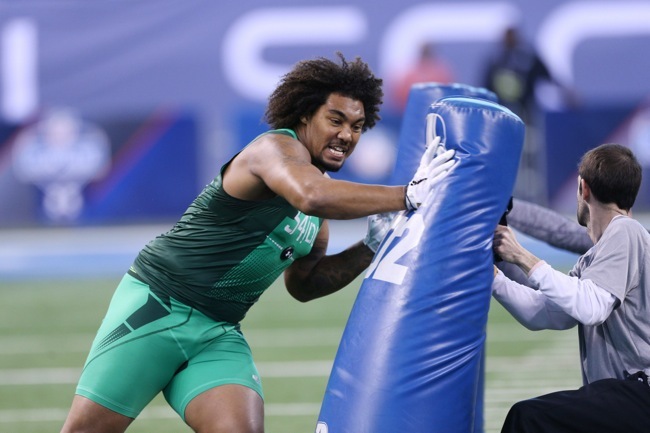 The pass rush prospects are worth looking at as well, but they are all undersized and counting on them would strike some fear in to me and may not be worth the risk. They may be better off going after an edge rusher and getting creative with pass rush packages, shifting some of their more physical ends inside.